This pen has been lovingly used. It comes complete with the original box, however the inner box is loose at the hinges. It does not come with original paperwork. 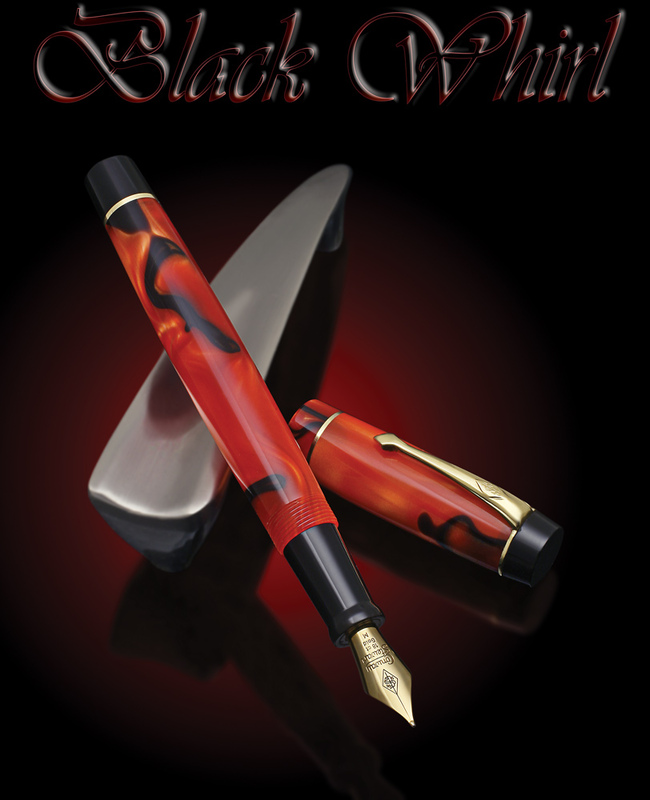 It was sent in to Mont Blanc on 09-12-17 for some tuning work on the nib, so it comes with the one year warranty from that date for the nib work. 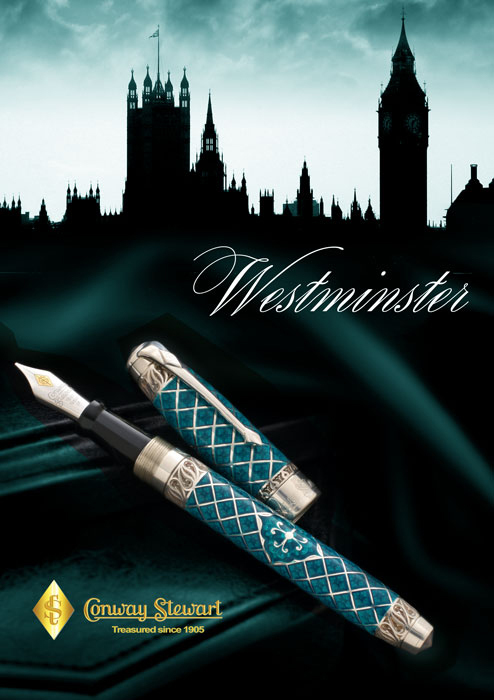 It is equipped with a Oblique Broad nib. 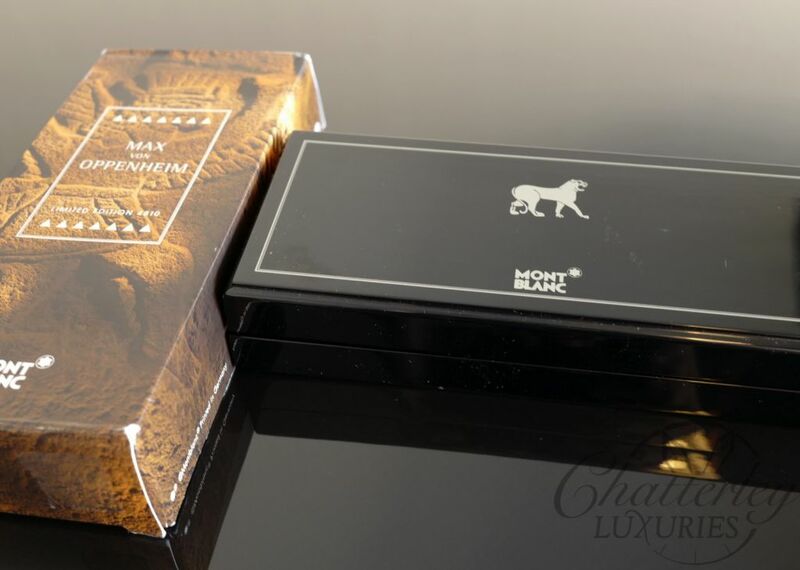 In connection with the annual “Montblanc de la Culture Arts Patronage Award”, which was established in 1992, Montblanc has issued a strictly Limited Edition fountain pen each year as a tribute to the most important patrons of art and culture in the past centuries, those whose personal commitment and achievements deserve wider recognition. 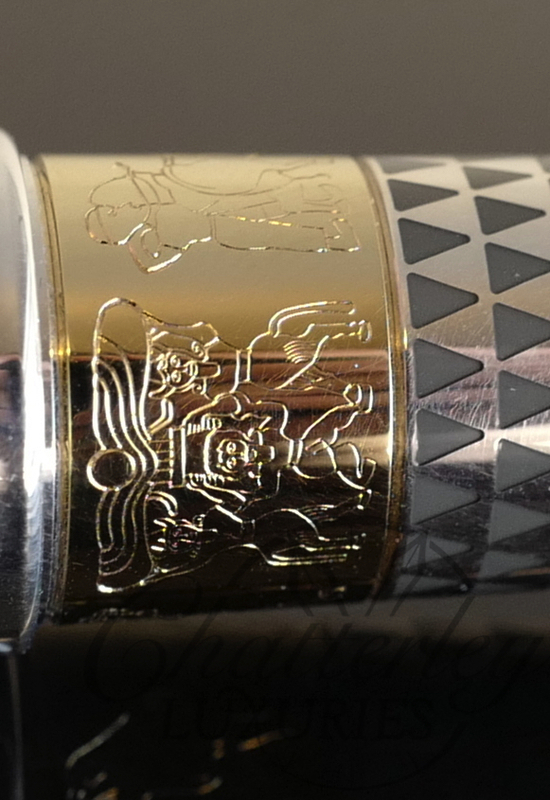 The 2009 pen honors the German archaeologist Baron Max Von Oppenheim. Baron Max Von Oppenheim was born in 1860 in Cologne into a wealthy and influential banking dynasty. After reading “Tales from the Arabian Nights”, he developed a passionate desire to travel to the East. His love of the Eastern world and his desire to explore it, led him to enter the service of the foreign office and he was sent to Cairo as a diplomat. In 1899 he embarked on a 7 month journey to the Middle East which he saw as the culmination of his archaeological career. He carried out excavations at the ancient settlement of Tell Halaf in northern Syria, which produced extensive finds from the prehistoric Halaf culture and the Assyrian empire, bringing light to a civilization which many believed had been lost forever. 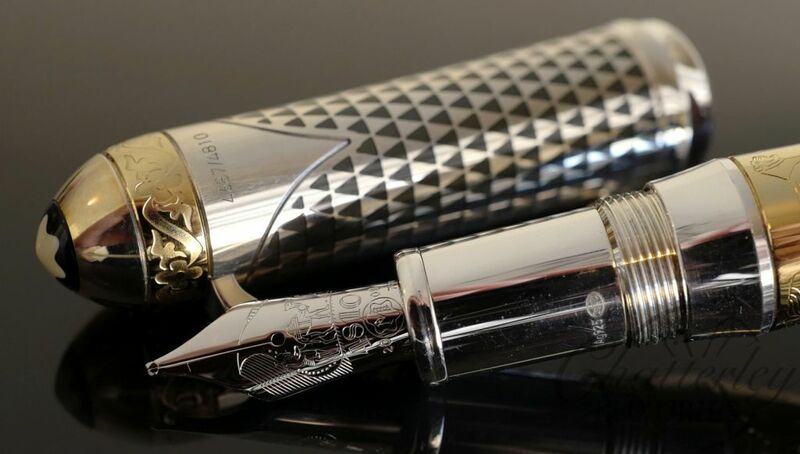 To honor a man who roamed from Europe to the East, this limited edition pen is inspired by the domes of the Eastern mosques. 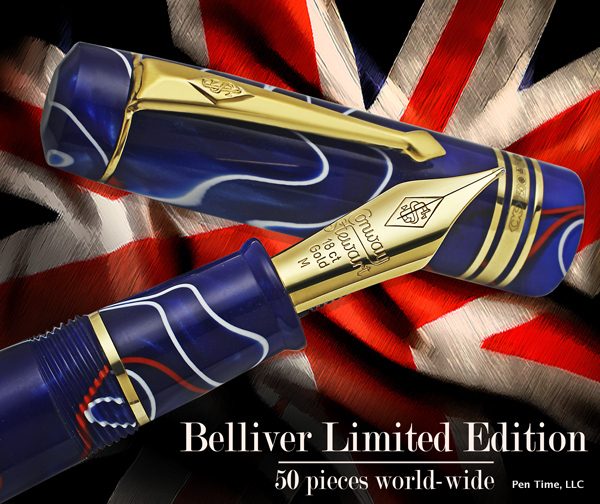 The mountings in 750 solid gold and the ivory colored laquer of the cap and barrel commemorate the magic of the Orient. 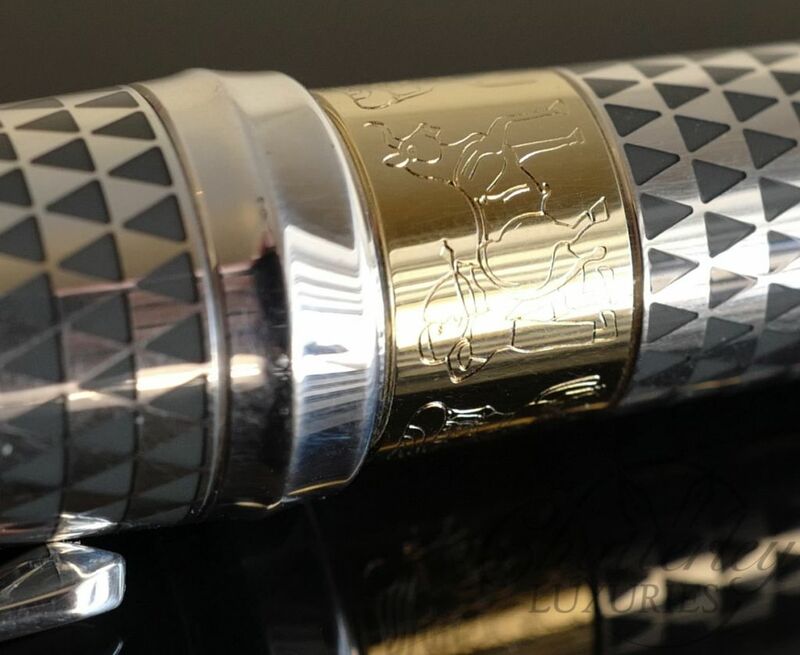 Solid gold rings on the barrel and cap are engraved with designs from Tel Halaf. The delicately engraved Bedouin motif on the 18K gold nib pays homage to Max Von Oppenheim’s passion for the tribes of the Arab world.